In response to continual increases in the volume of manuscript submissions it receives, the International Journal of Game-Based Learning (IJGBL) is seeking expressions of interest from qualified individuals to join its editorial board. The International Journal of Game-Based Learning (IJGBL) is devoted to the theoretical and empirical understanding of Game-Based Learning. To achieve this aim, the journal publishes theoretical manuscripts, empirical studies, and literature reviews. The journal publishes this multidisciplinary research from fields that explore the cognitive and psychological aspects that underpin successful educational video games. The target audience of the journal is composed of individuals working in the fields of educational games development, e-learning, technology-enhanced education, multimedia, educational psychology, and information technology. IJGBL promotes an in-depth understanding of the multiple factors and challenges inherent to the design and integration of Game-Based Learning environments. Previous experience performing reviews for academic publications is preferred but not essential. Please forward this email to your colleagues or to researchers you think may be interested in becoming reviewers for IJGBL. This entry was posted in Uncategorized on October 4, 2016 by admin. As you may already know, the forthcoming 6th Irish Conference on Game-Based Learning (iGBL2016) will be be hosted by Trinity College Dublin on 1st and 2nd September 2016, and we are delighted to let you know that bookings are now open. This year, 100 authors (e.g., teachers, researchers, and students) will be presenting their work and developments on games and learning through 49 presentations (e.g., workshops, game demos, research and practitioner’s presentations). We will also have a keynote from Derek Robertson. So, if you are enthusiastic about games and would like to share your experience or meet like-minded people, then iGBL will be a great event to attend, and you can book your place now. We look forward to seeing you at iGBL2016. For more information on iGBL2016, please email us at: igblconference@gmail.com or visit the official website (http://igbl-conference.com). This conference is sponsored by Learnovate and Develop-Project. This entry was posted in Uncategorized on July 14, 2016 by admin. This new book series takes the reader from no knowledge of Unity to reasonable levels of proficiency. It consists of three books: Foundations, Beginner, and Advanced. It includes step-by-step instructions that should be ready helpful to those new to Unity or to Game Development. The books are sold for an affordable price of 5$ each, and are available in several formats, including: Kindle, pdf, pr paperback. You can find more information on these books here. This entry was posted in Uncategorized on April 28, 2016 by admin. The Irish Conference on Game Based Learning (iGBL), formerly the Irish Symposium on Game-Based Learning, now in its sixth year, will be hosted by Trinity College Dublin on 1st and 2nd September 2016. This conference provides a forum for all stakeholders interested in exchanging ideas, projects, and best practices on the use of games and game-based approaches to support motivation, learning, and change. Researchers will be able to present and share their latest findings. Students will have an opportunity to present their research or showcase their games, and meet specialists in this field to obtain constructive feedback. Instructors will have the opportunity to discover new game-based teaching approaches and share new game-based skills that they can integrate in their teaching. Prospective presenters can now submit their abstract through the online submission system. We welcome abstracts from a wide range of stakeholders, including researchers, instructors, or students, who will have the opportunity to conduct workshops, present research results, or provide insights on how they managed to design or use games for educational or motivational purposes. 8th March 2016: Abstract submission deadline. 8th April 2016: Notification of acceptance. 8th April 2016: Successful research-based presentations are invited to submit a paper to be included in the conference proceedings. 19th April 2016: Early-bird registration deadline. 3rd May 2016: Registration deadline. 31st May 2016: Final submission of presentations and research papers. We look forward to receiving your abstracts. Unity 5 From Zero to Proficiency (Beginner): A step-by-step guide to coding your first game with Unity. A new book is available on Unity and its is called Unity 5 From Zero to Proficiency (Beginner). In this book, the second book in the series, you will become comfortable with scripting in Unity by creating a simple survival game. A list of the learning objectives at the start of each chapter. Opportunities to engage in deeper learning and problem-solving skills through challenges at the end of each chapter. Quizzes to test your knowledge. Cheat-sheets (i.e., shortcuts, best practice, etc.) that you can download. Chapter 2 helps you to code your first script. You will learn how to code following best coding practices, debug your code, and also avoid common errors. Chapter 3 gets you to improve your scripting skills, enhance your game and add more interaction. You will learn to implement a scoring system, to detect collisions, and to load new levels. Chapter 4 explains how you can create and update a user interface for your game (e.g., displaying images and messages onscreen) using scripting. Chapter 5 explains how you can polish-up your game. You will add a splash-screen, a simple inventory system, sound effects, as well as a mini-map. Chapter 6 explains how to add Non-Player Characters (NPCs) with Artificial Intelligence (AI). You will configure each NPC and get them to either follow the player or walk along a simple path of your choice, and also detect collision with them. Chapter 7 provides answers to Frequently Asked Questions (FAQs) (e.g., scripting, audio, AI, or user interface). This entry was posted in Uncategorized on December 23, 2015 by admin. New Book “Unity from Zero to Proficiency (Intermediate)” is available on Amazon. 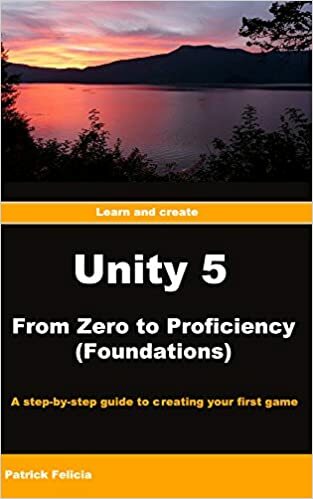 In this book, entitled From Zero to Proficiency (Foundations), which is the first book in the series (i.e., Foundations, Beginner, Intermediate and Advanced), the readers will become comfortable with Unity’s interface and its core features, by creating a project (with no coding involved) that includes both an indoor and an outdoor environment. Opportunities to engage in deeper learning and problem-solving skills through the challenges offered at the end of each chapter. Chapter 1 provides general information on game engines and explains why you should use such software, and how, by using Unity more specifically, you can create games seamlessly. Chapter 2 takes you through the very first steps of installing Unity and becoming familiar with the interface. It will also show you the different shortcuts necessary to navigate through scenes and projects in Unity. scene by combining built-in objects. You will learn how to manage objects, apply textures and colors, and transform objects to create a simple scene. Chapter 4 explains how you can create an indoor scene (i.e., a maze) with built-in shapes. You will also work with and manage lights in your scene to set the atmosphere and navigate through the scene with a First-Person Controller. Chapter 5 explains how to create an island with sandy beaches and palm trees using Unity’s built-in assets. You will also drive a car and pilot a plane. Chapter 6 provides answers to frequently asked questions. You can obtain more information on this book on the official website. This entry was posted in Uncategorized on October 29, 2015 by admin. This entry was posted in Uncategorized on June 4, 2015 by admin. This symposium provides a unique opportunity to share and gather insights on game-based learning and gamification from different perspectives including education, sociology, educational psychology, Human Computer Interaction (HCI), artificial intelligence, game design, game development and instructional design. Submissions are welcome on any topic related to the use of games and gamification to enhance teaching and learning. This year the Cork Institute of Technology, in partnership with SEGAN (Serious Games Network), will host iGBL2014 on Friday 6th June 2014 and will offer a dynamic programme with plenty of opportunities for networking and discussion. The programme will include presentations, workshops and pecha kucha sessions as well as interactive poster presentations. All accepted abstracts will be included in the conference proceedings, with the possibility of publication in the International Journal of Game-Based Learning (IJGBL). All submission types require that authors submit a 300-500 word abstract to be received by 4th April 2014. Submissions must be made via the online form: http://bit.ly/1izckir. Please ensure that all required fields are completed. Abstracts must include the proposed title for the submission, the full names and affiliations of all authors, and the contact details of at least one author. In the case of multiple authors, please specify who will be the presenting author at the symposium. All submissions will go through a double-blind review process. This review process will take approximately 3 weeks and final notifications will be sent by 28th April 2014. After the presenting author(s) have booked their place at the symposium, the presentation will be fully accepted for inclusion in the programme and book of abstracts. We hope to see you at iGBL2014! This entry was posted in Uncategorized on March 13, 2014 by admin. Authors are invited to submit manuscripts to be considered for inclusion in the first issue of the fourth volume of the International Journal of Game-Based Learning (IJGBL) (http://igi-global.com/ijgbl/) to be published in April 2014. Papers should be submitted on or before 15th October 2013 to ijgbl.editor@gmail.com. The mission of the International Journal of Game-Based Learning (IJGBL) is to promote knowledge pertinent to the design of Game-Based Learning environments, and to provide relevant theoretical frameworks and the latest empirical research findings in the field of Game-Based Learning. The main goals of IJGBL are to identify, explain, and improve the interaction between learning outcomes and motivation in video games, and to promote best practices for the integration of video games in instructional settings. The journal is multidisciplinary and addresses cognitive, psychological and emotional aspects of Game-Based Learning. It discusses innovative and cost-effective Game-Based Learning solutions. It also provides students, researchers, instructors, and policymakers with valuable information in Game-Based Learning, and increases their understanding of the process of designing, developing and deploying successful educational games.IJGBL also identifies future directions in this new educational medium. Research papers submitted for this journal must be original submissions and should be between 5,500 to 8,000 words in length. Interested authors must consult the journal’s guidelines for manuscript submissions (http://www.igi-global.com/AuthorsEditors/AuthorEditorResources/JournalDevelopmentResources.aspx) prior to submission. All submissions will be forwarded to at least three members of the Editorial Review Board of the journal for double-blind, peer review. Final decision regarding acceptance/revision/rejection will be based on the reviews received from the reviewers. All submissions must be forwarded electronically to ijgbl.editor@gmail.com no later than 15th October 2013. This entry was posted in Uncategorized on September 12, 2013 by admin. Getting Started with Unity is out ! Getting Started with Unity is for 3D game developers who would like to learn how to use Unity3D and become familiar with its core features. This book is also suitable for intermediate users who would like to improve their skills. No prior knowledge of Unity3D is required. In this book, you will be introduced to a wide range of the core features used for games developed with Unity3D, including the user interface and much more. Furthermore, you will also learn about essential aspects like transformations, scripting, navigation, and built-in controllers. Beginning with an introduction to the user interface, you will learn the necessary skills required to create a survival video game. Each section is a stepping-stone toward the completion of the final game. By the end of the book, you will have created an indoor level with enemies, AI, weapons, objects to collect, and all the logic to control the game. This entry was posted in Uncategorized on August 19, 2013 by admin. Stay up-to-date with our newsletter on GBL, Unity, and more...!